Progression through love, pain and experience. It's been a warm week, which is nice for city life, but not so nice for upcoming long weekends in Vermont. Darren's on his way up to Killy with a gang of 30 for the weekend and I'll be riding Okemo with another 10 or so. Hoping for spring conditions, but more likely it'll be the icy slopes the east coast is so well known and loved for. So apparently this weekend is also Valentine's Day. Having two brothers that are married, and a sister in law that's pregnant, I get my fair share of inquiries from family members about girlfriends, love, marriage, and grandchildren - the most recent installment of which came from my mother yesterday. I casually responded that instead of hanging around town to take advantage of White Castle's Valentine's Day special, I'm going to trek it up the 4 hours to VT and hang out with 10 dudes in a house that fits 6, crammed about a fireplace and drawing straws for beds.... Romantic enough yet? Well, we'll all be hugging onto our boards and maybe i'll give mine some V-day waxing love. Past and present. What does it mean to you? 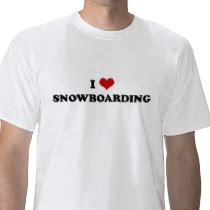 Your love of snowboarding - in a mere six words. i love my snowboard, isn't that good enough! Oh man, it hurts so good! Snowboarding is my escape from reality. learn from the past, enjoy the present :) look to the future! happy vday ~~ !